This is a beautiful and informative guidebook and history of HMS Victory. On 7 May 1765 a magnificent new ship of the line was floated out of the Old Single Dock in Chatham's Royal Dockyard. 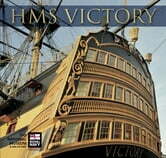 She was HMS Victory, a first-rate battleship and the largest and most up-to-date ship in King George III's Royal Navy. In the years to come, over an unusually long service, she would gain renown leading fleets in the American War of Independence, the French Revolutionary War and the Napoleonic War. She achieved lasting fame as the flagship of Vice-Admiral Lord Nelson in Britain's greatest naval victory, the defeat of the French and Spanish at the Battle of Trafalgar. It is almost impossible today to imagine the physical brutality of fighting at sea in sailing warships. These great wooden battleships, under acres of sail, confronted each other at point blank range, their crews intent on smashing and capturing the other ship. Their heavy guns blasted tons of iron, shattering hulls, splintering masts and yards, overturning gun carriages and filling the air with deafening noise and blinding smoke. She may seem beautiful to our eyes, but Victory was built principally as a huge and complex machine of war. Every man in her 820 crew played a vital part in operating the ship and ensuring that ultimately she was in the right place and ready to fire her deadly broadside of iron shot.